Edited by rgillis783, 06 June 2018 - 12:45 PM. Please PLEASE change buffer to 4 seconds per move. Thank you Nortrom for such dilegence. Weird. I've never known of that being a rule. That is satire for everyone who is not a native English speaker. 'English' is actually the only word in the English language where e does come before i without a c.
I think that's not correct. I asked him to remove it until yesterday, and he did nothing. It is UNACCEPTABLE to characterize me with that post, as "disconnecter" and to shame for that, as the title of the topic is Disconnecting losers(hall of shame). If I used to do that(disconnections), there could be a fact for him to post. In the case now, he only faced me once and I had a disconnection for personal reasons. HE HAS NO RIGHT to use my name, in order to satisfy his egoism. I expect from MT to demand from astros to stop annoying me and remove his abusive post. If MT want more infos, I could give them in pm, and not in public as I don't use to promote public disputes. I want to being a harassment and libel case against dalee. Please note that dalee states that he left to attend to a crying infant and not because his internet connection failed. As someone who has played over 3,000 games, dalee should no that closing out the game window pops up the disconnection timer and does cause the player to immediately surrender. Therefore, based on the video evidence above and our post-match conversation I am confident beyond a shadow of a doubt that dalee disconnected intentionally to waste my time. 1. Did dalee intentionally disconnect? 2. If the MT feels that this is the case, then you have voted that dalee is lying. The question is then does dalee's behavior constitute harassment and libel because he is pushing a false narrative against me to cover up his own immaturity. If the MT finds dalee guilty, I ask that they issue dalee a Warning Point. Because dalee is libeling me, I believe that he should have his posting privileges suspended until he makes an allocution about disconnecting against me. Since this happened in a tournament match, I also ask that the TC award dalee a yellow card in the Champions League for harassment and that the TC suspended him from tournaments until he admits to disconnecting. The MT will not ask Astros to remove his post from the 'disconnector' thread. The thread - though it was once pinned for some reason - is not an MT thread. It was begun by a regular player who encouraged others to post proofs of players who disconnected rather than surrender. People can look at the thread and make up their own minds about the players reported in it. Of course players who say it is unfair that they are in there can make posts in the thread to justify themselves. The MT also decides there is no case of 'libel' against Dalee for his comments about Astros motives in making the post. The thread seems to mostly be for players that are concerned about sportsmanship, but also we can see that some may use the thread for egotistical reasons to show they beat someone badly etc. It is not possible to prove what the motives for anyone posting there is. I guess you want to say ie before u in the 2nd fks post above yours? American does also have e before i except after c, right? it seems worthless to find a logical right on this forum. The topic title humiliates anyone who gets on its list. 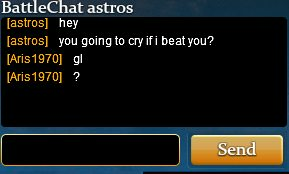 It is unbelievable that the pathetic player astros characterize me as a player that doing such actions in my games. A single time, with specific situation, cannot give the right to someone as astros to do that. By the way MT, I can see the way you act now. You have problem to manage the power. Some of you, have problem with me and you lost(if you had any) your fairness. In astros report, there are links from a pm that he published in public. It is right for you, or you don't know the forum rules. Also there is no reason for the report for him to publish the pm. Anyway, I don't want to waste more of my time for such situations and unworthy persons. Maybe I have different ethics, that don't belong here. I ask from MT to delete my account from the site, but keep all my posts that I did in forum. Wow guys really? do we have to go through this again? why is it all so political??? the MT bans people that do bad stuff like draw refusal and abuse, and hopefully tries to better the site through communication with admins. They are not here to point out "this guy is a good guy, this one is ok but I don't really like him so we will find a way to do something against him". If a decision doesn't go your way, too bad, just remember they are human and no matter how hard they try to be professional they may put their opinion on something, and this may not be of the same opinion as you. Does it hurt? yes, but it's just a game for crying out loud, move on and have some fun! There is no need get mad at one another and leave the site or the game. If you have a problem with someone, just don't talk to that player. If someone says you are something, prove otherwise in your actions. If you really were having disconnection problems dalee, then people will eventually find out what you really are, which I believe is a valuable member of this community (and a great asset to the Greek stratego players) and someone who is not a bad person trying to do anything wrong in always wasting time, refusing draws, or being abusive. I had permission from two moderators to share the private messages directly related to the incident. My personal take: You'd have had more success in astros removing the post after apologzing for the disconnect & promise not to do it again. You basically triggered astros to be stubborn about this topic (whether this is a distasteful decision or not). May be as a result of past experiences, but I think it's better not to. Only causes pointless arguments.